A sneaky preview of of Carina’s May 2018 article! May is our anniversary month. Next year is the big 25 years. Oh my goodness. I remember my parents 25th anniversary. I thought they were ancient! Our front living room was tiny and we all huddled in (all eight children, parents, Margaret our guardian angel and a throng of visitors bearing gifts. My parents circle of friends now I think about it was massive. First generation Italians they list of cousins and aunts was huge and they were never far away when homemade pizza was in the oven. As the youngest of such a large family almost all of my parents generation sadly are no longer with us. Our circle of close friends is far smaller although the people we know are endless. My children too know loads of people but their closest friends they value very highly. May is also the start of the asparagus season. So exciting. We are a seasonal business and a seasonal family. I’ve said it many times before but why would you want to eat produce from halfway around the world that may have used vital water reserves or even land that should be used to sustain the local community when you can wait to enjoy fresh seasonal food. Asparagus has one of the shortest seasons of all our produce. If we’re lucky we’ll get 6 – 8 weeks of produce from our dear friends the Pattullo’s up in Glams. When you think about strawberries they can grow from May all the way through to September so much longer to enjoy local varieties but asparagus has to be treasured – just like that handful of very special friends. 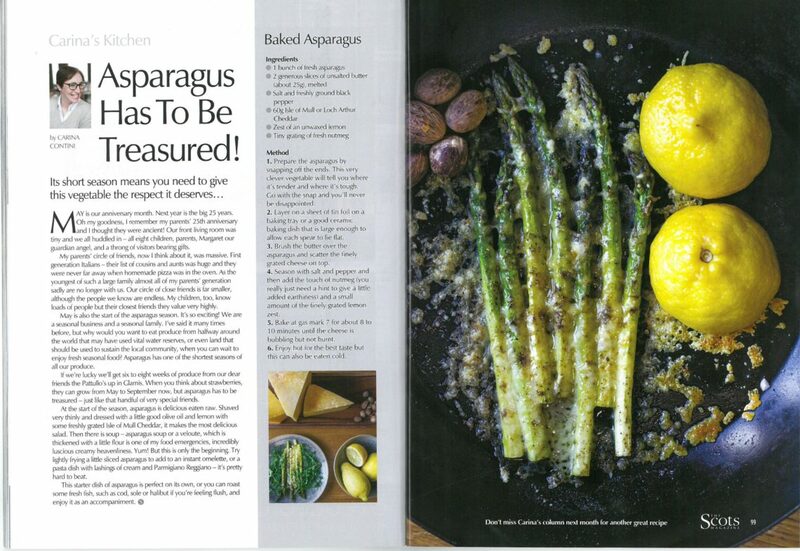 At the start of the season asparagus is delicious eaten raw. Shaved very thinly and dressed with a little good olive oil and lemon with some freshly grated Isle of Mull it’s the most delicious salad. Then there is soup. Asparagus soup or a veloute which is thickened with a little flour is one of my food emergencies. Incredibly luscious creamy heavenliness. Yum. But we’re just starting. Try lightly frying a little sliced asparagus to make an instant omelette or a pasta dish with lashings of cream and Parmigiano Reggiano is pretty hard to beat. This starter dish of asparagus is perfect on it’s own or you can roast some fresh fish such as cod, sole or halibut if you’re feeling flush and enjoy as an accompaniment. Enjoy hot is best but this can be eaten cold. This is Aunt Mafalda’s recipe. Here granddaughters (Patricia and Nicola) will be asking me to make it if they see I’m sharing her recipe. Preheat the oven to 180ºC/350ºF/Gas 4. Put the hazelnuts on a baking tray and toast in the preheated oven until golden but not brown. Remove from the oven and leave to cool. Reset the oven to 190ºC/375ºF/Gas 5. Put the hazelnuts in a food processor or blender and grind to a fine powder. Set aside. Either generously oil a 30cm ceramic ovenproof dish or line a baking tray with greaseproof paper and draw round a plate to mark a 30cm circle. If you use a dish, the presentation can be better. Beat the egg whites until stiff in a clean, dry bowl. Very gradually beat in the sugar until the mixture is stiff. Be careful not to overbeat the mixture or the meringue will crystallize when cooking. Gently fold in the ground hazelnuts and finally the vinegar and vanilla extract. Spoon the mixture into the dish or within the circle marked on the greaseproof paper. Bake in the preheated oven for about 30 minutes until the meringue is golden and risen. Remove from the oven and leave to cool. Meanwhile, make the apricot cream. Put the cream in a bowl and whip it. When it is approaching soft peak stage, add the apricots and fold in until the mixture is light and fluffy. Don’t whip the cream once you have added the apricots. If you have baked your meringue on a baking tray, remove the greaseproof paper and put the meringue on a serving plate. Spoon the apricot cream on top of the meringue. One advantage of visiting Italian relatives is they always come with food. This was Aunt Mafalda’s recipe. Happy days!